Not Just an Arm Party! 1. The watch – Bought by Mom, not exactly my loot, when she visited Rome early last year. Her stories about the city made me and my Dad reminiscing on our family trip to Rome ages ago and that’s when it then spiraled into a full-blown family holiday planning to several countries in Europe that we did at the end of last year. It all started from her me-time holiday. 3. 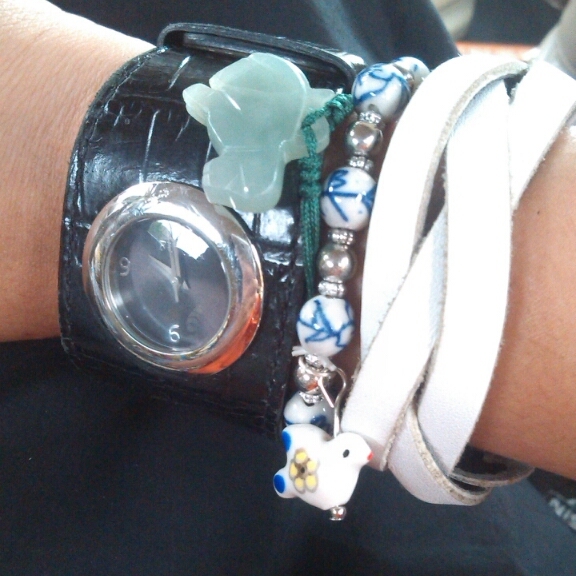 Delftware bracelet – Bought in Amsterdam and it’s the pattern that mimic the famous Delftware. Long time ago, I dreamt of living in Delft but life has taken me to a different path. It’s of course for the better. Amsterdam was the first city that we visited during the family holiday end of last year and it leaves and impeccable mark on Raysa’s memory. Maybe one day she’ll be the one studying at TU Delft? 4. The white leather cuff – This is bought on my first trip to Bangkok and eversince that time, I’m head over heels with the city. I don’t mind going back again and again to Bangkok. It’s the second time around I leave Raysa for business trip after her birth.